On a ranking of which companies we should feel comfortable trusting with our personal data, Walmart deserves to be somewhere at the bottom near Facebook and The Trump Organization. There’s just something unseemly about giving any sort of information to Walmart, like you’re a kid in a horror story getting tricked into giving your little brother to the spooky voice coming out of your closet. You don’t necessarily know that something bad is going to happen, but it seems likely that you’re going to have to explain to your parents why Billy got eaten by a ghost. Anyway, Walmart may soon have a much easier time getting its twisted claws on some very specific information about its customers, because the company recently filed for a patent on new “biometric shopping handles” that can monitor a shopper’s “heart rate, palm temperature, grip force, and walking speed” while they’re pushing a cart. That comes from Motherboard, which says that Walmart has all kinds of high-minded goals for these palm scanners, like being able to tell when a customer needs medical assistance or if they’re about to get into a fight. We don’t have mountains of research on Walmart shoppers to back this up, but the idea of spending a bunch of money to install biometric scanners on shopping carts just so employees can be notified if a customer is about to pass out or start wailing on the guy who took the last Dr. Thunder seems absurd. 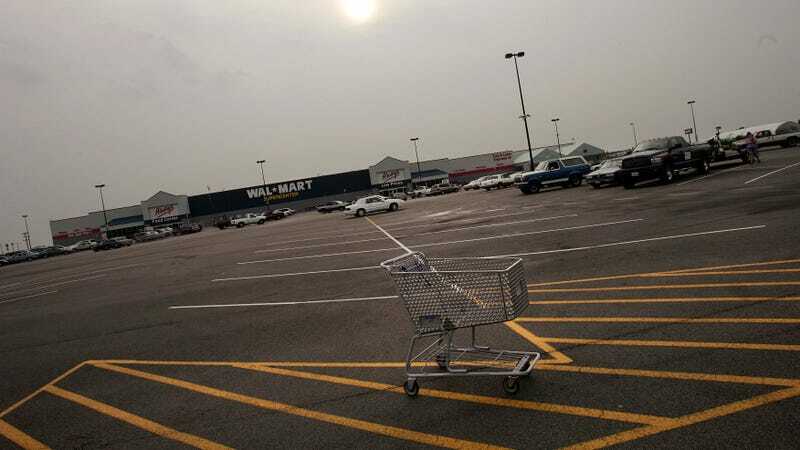 The scanner would only while someone is physically touching their shopping cart, which someone probably wouldn’t do while they’re passing out or throwing punches. It seems far more likely that this information would be use to track a customer’s physical reaction to things while shopping, so Walmart will now know if the big “Back To School” sign over the gun rack really gets its shoppers all hot-palmed. The Motherboard story doesn’t say when these new cart handles might be installed, so we think everybody should just start carrying all of their Walmart groceries in the arms from now on. That way, nobody will know when you decide to throw down.